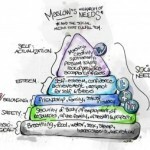 Abraham Maslow’s hierarchy of needs, which he proposed in 1943 is still a popular theory today for explaining human motivation, especially in management. At a first glance, it seems quite similar to the ancient Hindu Chakra system, especially when some of Maslow’s pyramid diagrams are colour coded using the rainbow, rather like the above picture. The chakras were first proposed in the sacred Hindu scriptures, the Vedas, which were orally transmitted since, what seems like, the beginning of time, and were first written down around 1900BC. Maslow’s theory came from studying people he described as exemplary, or inspirational – people such as Albert Einstein or Eleanor Roosevelt. Psychologist Mihaly Csikszentmihalyi also studied exemplary people and found that these people regularly engage in activities in which they lose themselves to bring about a state of flow, or in meditation terms, they lose themselves in the gap which is where our unbounded consciousness – the space between our thoughts and ego – lie. The gap is the place where we find our pure potential and infinite possibility. 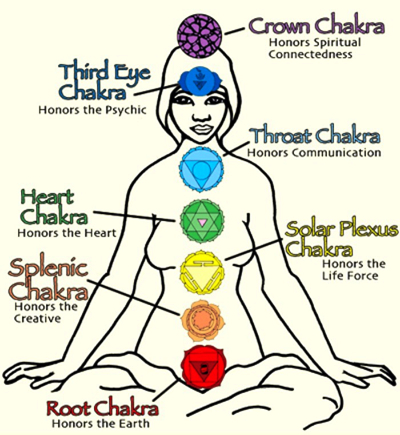 The chakras are seven energy centres which run from the base of our spines to the top of our heads in our bodies. They are gateways connecting us to the world we live in and beyond to the universal life force known as Shakti, the most magnificent expression of flow, a place of infinite possibility. We awaken Shakti energy and activate our chakras through meditation. Indeed, the ancient texts have described masters of Shakti being able to meditate during a storm, control nature, and command supernatural powers. If this sounds rather far fetched, research in neuroscience has shown that meditation can help rewire the neural networks in our brain which in turn reduces the amygdala or lizard brain – the prehistoric part of our brain – where we register emotions such as fear, anger and anxiety, thus the end result makes us feel more at peace and at one with ourselves and the world around us – powerful stuff. We can calm our inner storm and be still when all is not. And even less esoterically speaking, the chakras are where our nerve endings collect and our blood vessels are concentrated, which affect our hormones, our immune functions, and our vital energy. Focusing in on the chakras and awakening Shakti through meditation can make us feel emotionally balanced or even enlightened. The word enlightenment has many meanings, but one lovely definition from the Buddhist tradition is we become enlightened by knowing ourselves. When we feel more self-aware and less emotionally agitated, when we sit quietly with ourselves and breathe deeply, it is easier to answer the question: Who am I? A difficult question to answer, perhaps. But, once we tolerate, love, and have compassion for our own dear selves, it is easier to extend tolerance, love, and compassion to others. Inversely, when we are intolerant of ourselves, we are intolerant of others. Jesus knew this when he said: Love your neighbour as yourself. You cannot love someone if you do not know how to love yourself. You cannot give someone something you do not have, whether this is food and shelter, or love and compassion. Maslow’s pyramid echoes a similar journey. 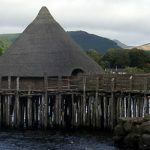 At the most basic level, our needs are physiological – we need food and shelter, for without them we cannot function and their lack makes us fearful and anxious. 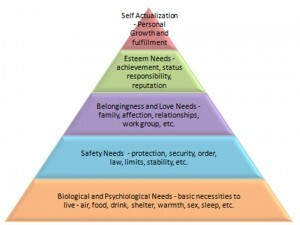 Maslow called all four of the bottom needs deficiency needs. Along with food and shelter, we need safety, love, recognition and esteem from others, otherwise we feel deficient, and this makes us strive to find our place in the world. It is only when we are satisfied, and feeling fulfilled can we self-actualise and share that by deed or word. The main difference between Maslow’s theory and the Chakra system is that Maslow looks outside of us to satisfy needs, to work for our food and shelter, to work for our community and love, to strive. In contrast, the chakras encourage us to look inside to connect to Shakti or flow to meet our needs. There is no striving, only surrender. When we are at one with all things, we respond and interact. When we are separate, we tend to react and contract. Mahatma Gandhi was aware of this when he said, Be the change you want to see in the world. You can literally change the vibration of your life and what and who goes on around you when you behave differently. Physiological needs such as food, water, and shelter which make humans think of little else are found in the Chakra system at the Root chakra represented as ruby red and the earth, it is our foundation, it’s mantra is I am; and the Sacral chakra which is orange and water, it is nourishment, purity, and protection, it’s mantra is I create. Safety needs either personal or job security are found at the Solar plexus chakras represented as yellow and fire. It is our power centre where our emotional and physical fires burn bright with transformation, intention and desire, it’s mantra is I do. Social needs such as belonging to a club or a family, to give and receive love are found in the Heart chakra which is green and air, it is innocence and pure, a connection to the infinite, the divine, it’s mantra is I love. Esteem needs to respect ourselves and have others respect them are at the Throat chakra which is blue and space, it is connection and communication, it’s mantra is I express. Self-actualisation needs are when humans want to do realise their potential, and feel fulfilled, this is seen in the Third eye, or Brow chakra, it is purple and light, it represents clarity and judgment, it’s mantra is I see. Transcendance needs were added by Maslow later on, and aren’t shown in the pyramid above. However, they correspond to the Crown chakra at the top of head, otherwise known as the thousand petal lotus, it is ultraviolet or white, it is about connecting to source, to feel unity with the great consciousness, it’s mantra is I understand. People who have awakened or connected to Shakti tend to be constantly evolving and expanding. They are energetic and are often described as young or youthful. It is easy to lose this expansion and delight with life, as we grow older and, I think this is why we are culturally obsessed with youth. 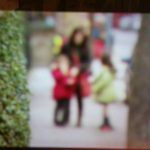 Our young constantly evolve and expand, they are full of potential and promise, unlike the older members of our society who have had responsibility and routine creep in, making their potential and promise options seem fewer. However, it is not too late. It is possible to reclaim that promise if we surrender to the flow, to that divine Shakti energy, and remember our desires, which we are told in the Brihadaranyaka Upanishad can lead to our destiny. Let’s dive deep and reconnect to our driving desires.